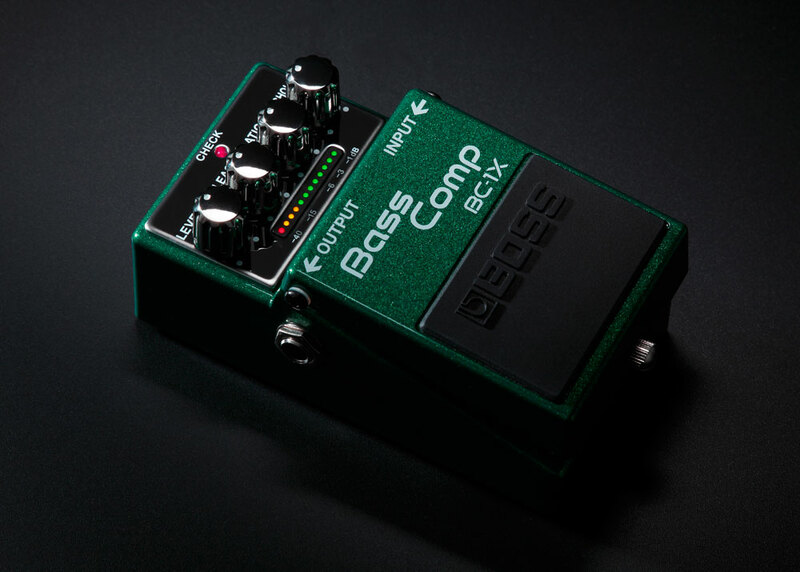 If you play bass, you really need to check out the BC-1X Bass Comp, an all-new stompbox equipped with advanced BOSS technology. The BC-1X is unique among bass compressor pedals, providing intelligent multiband compression that seamlessly adapts in real time to your touch and note register. Transparent, powerful, and easy to use, the BC-1X lets you dial in a wide range of compression without altering your core bass tone. OSS BC-1X Bass Comp featuring Janek Gwizdala video. Like the other X-series pedals for guitar and bass, the BC-1X features BOSS’ innovative Multi-Dimensional Processing (MDP) to deliver new levels of stompbox performance. Released one year ago to wide acclaim, the BB-1X Bass Driver utilizes MDP to provide an advanced bass preamp and DI in pedal form. Now, the BC-1X Bass Comp leverages the massive power of MDP to bring another essential tool to bassists. 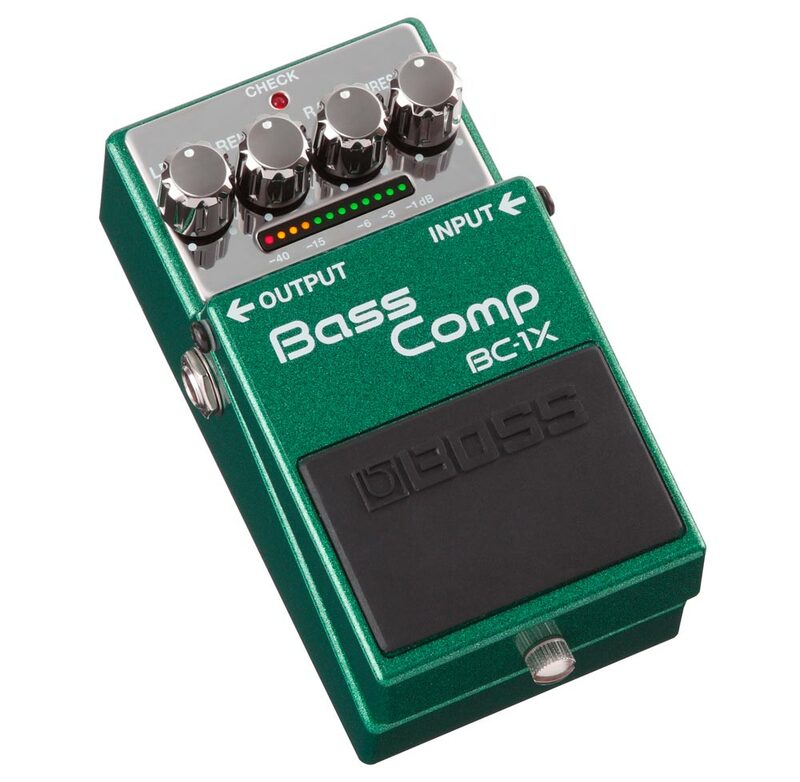 Equipped with advanced BOSS tech, the BC-1X delivers performance beyond typical pedal-based compressors for bass. Conventional compressor designs squeeze the fundamental tone, which translates to a loss of definition and punch. In contrast, the MDP engine in the BC-1X provides perfectly natural compression that never overwhelms the character of your instrument. Even when using aggressive compressor settings for effect, every bit of your playing is processed accurately, ensuring that your pure tone always shines through. The BC-1X delivers punchy, well-defined tones at every setting. Simple and intuitive to operate, the BC-1X is equipped with the familiar Ratio, Threshold, Release, and Level controls found in studio compressors. But while the controls are straightforward, there’s a lot of complex processing going on when the knobs are turned. As you play, the BC-1X analyzes the signal and applies the appropriate amount of compression based on frequency range and playing dynamics. This enables you to get studio-quality tones quickly and easily, without the fussy fine-tuning often required with other compressors. Panel knobs and gain reduction indicator on the BC-1X Bass Comp. Going beyond its outstanding compressor performance, the BC-1X was designed with the needs of pro players in mind. A 12-segment gain reduction indicator clearly displays the amount of compression at all times, an extremely useful feature rarely seen in a stompbox compressor. The 18-volt input circuitry provides ample headroom, even with ultra-hot signals from active basses. Additionally, the pedal’s noise performance is extremely low in comparison with other compressors, another huge benefit of the BC-1X’s sophisticated MDP engine. To learn more about the BC-1X, visit BossUS.com.